When diagnosed with an aggressive brain tumour, Gudrun Pflüger was told she had eighteen months left to live. Taking the wolf—a true “endurance athlete”—as her model, she immerses herself in the wilderness of the mountain ranges of western Canada and focuses her mind and body on a mysterious and inspirational path toward self-healing. 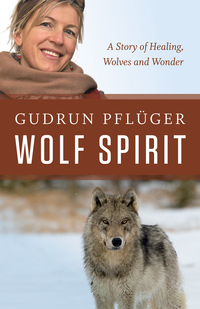 Through an intensely personal, scientific and emotional connection with the wolves she studies and the glorious landscape that surrounds her, Gudrun Pflüger tells a touching and absorbing story of the transformative and healing power of nature. Gudrun Pflüger is a former professional cross-country skier and mountain jogger who is also a certified biologist. After retiring from athletics, she relocated to Canada, where she became involved in the conservation of British Columbia’s coastal wolf population. Her research has been documented in the much lauded, award-winning film Searching for the Coast Wolves. She now lives near Salzburg, Austria, with her son Conrad, and advocates for the acceptance of wolves in her homeland.